Grass allergy rates in the top three pollen allergies along with ragweed and birch tree allergies. People with pollen allergies develop allergic rhinitis, a reaction triggered by the pollen of certain plants as it is released into the air. Grass pollinates in early spring and throughout the summer, and its pollen grains spread throughout the environment by the wind. As it travels, some of this pollen is inhaled by humans and animals, causing a wide range of signs and symptoms of grass allergies in those with a sensitivity to pollen. Among the most common symptoms of allergic rhinitis caused by a grass allergy are watery, itchy eyes. Allergic conjunctivitis can occur, which causes inflammation of the eyelids. This condition is marked by a red-rimmed, swollen appearance in the eye area and sometimes spurs excess eye secretions that form a crust on the eyelid. Dark circles, commonly called "allergic shiners," can appear under allergy sufferers' eyes as well. Nasal symptoms are prominent with allergic rhinitis. 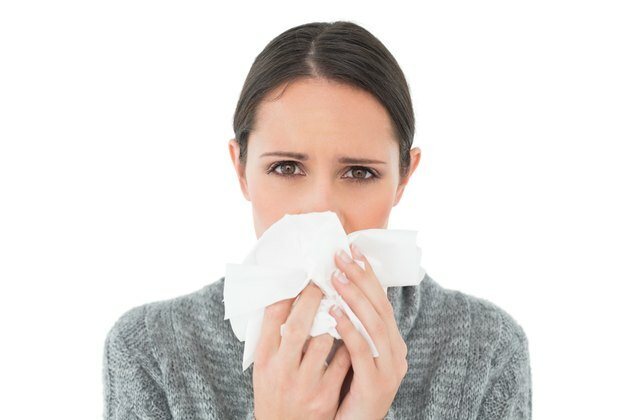 Itchy nose and sneezing are common problems, as are congestion and post-nasal drip. Sore throat is common, and it is often accompanied by a constant dry cough. Some grass allergy sufferers might experience breathing issues that range from minor wheezing to serious asthma attacks. Those with grass allergy might experience skin reactions when direct contact with grass pollen is made. These most often occur on the hands and fingers during activities such as lawn mowing, but they can occur anywhere on the body. These reactions range from minor irritation, including itching and redness, to rashes and hives. Many grass allergy sufferers simply feel sick and tired throughout pollen season, a general feeling of malaise that can greatly affect the quality of life for some people during allergy season. A feeling of extreme fatigue is a frequent complaint, and sleep is often disrupted by allergy symptoms. People who suffer allergic rhinitis often complain of "brain fog" -- feeling mentally slow and disconnected, and unable to concentrate. Allergic rhinitis can impair the senses of smell and taste, which can reduce the enjoyment of food, affecting the appetite. Irritability is common, as are frequent headaches, mood swings and even nausea for those who are affected by seasonal allergies. If your grass allergy is persistent or affecting your quality of life, consult your doctor. What Are the Effects of Breathing in Mold or Mildew?